The gambling forums and Youtube are buzzing since Michael Morgenstern posted a youtube video of a live Blackjack dealer at Betonline casino alleging cheating. 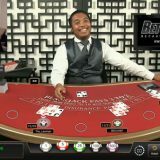 Is The Live Dealer Cheating? 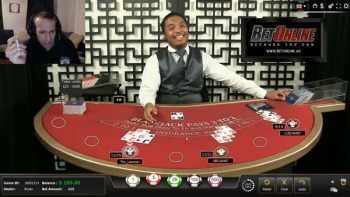 In the video you can clearly see the dealer appears to flip up the top card in the dealing shoe and deals the next card from underneath it. If the dealer is cheating then you’ve got to ask yourself why he would do such a thing when it’s being streamed live online. It doesn’t really make sense. The tables that Betonline use are provided by Global Gaming Labs and from what I can see it’s a generic table used by lots of different casinos at the same time. It all looks rather clumsy to me. Regardless of whether this is found to be cheating or just a poor dealer in action it will not do the online gaming industry any favours at all. I find it hard to believe that Global Gaming Labs would be involved. Most of their income will come from license payments from the casinos and a share of the revenue taken at each table. So GGL are never in a losing position. Surely their reputation is greater than the few dollars they’d make by using a cheating dealer. I’ve contacted GGL for a comment so will see what transpires.